Located waterfront, just across The Renaissance Park in Chetumal, Hotel Noor has gardens and an outdoor pool for the guests’ enjoyment. It also features complimentary Wi-Fi access and private parking on site. Hotel Noor’s rooms and suites provide flat-screen cable TVs, toiletries and telephone lines. Some suites may have a minibar or a hot tub. They are decorated with a modern, minimalistic style and may overlook the sea. The On-site restaurant specializes on international cuisine and is open Monday through Staurday from 08:00 to 24:00 hours. Other restaurants may be found within a 3 minute walk from the hotel. Ther is also a supermarket 5 minutes’ walk away. The City Hall and Main Square can be reached in 3 minutes by foot, and the Mayan Culture Museum is only 10 minutes’ drive from Hotel Noor. The ADO Bus Station can be reached in a 20-minute drive and Chetumal International Airport I only 10 minutes’ drive away. This modern hotel is situated on the main road in the leisure area of Chetumal just a few minutes walk (700 m) from the beach. The centre with its array of shops, bars, restraints and exciting nightlife venues is extremely close by. The Government palace is especially worthy of a visit. A stop for public transport is roughly 50 m from the hotel and the local airport is also nearby. This hotel comprises 176 rooms spread over 3 floors. Hotel facilities include a lobby with a reception, a cloakroom, a hotel safe and a public Internet terminal. Various conference rooms, a perfumery and car hire services also feature within the hotel. Dining options include a bar and an air-conditioned restaurant with a non-smoking area. Room and laundry services round up the offerings at this hotel and those arriving by car may make use of the car parking and garage facilities. The modern and comfortable rooms feature a private bathroom with hairdryer as well as a balcony. Technical facilities come in the form of satellite/cable TV, a direct dial telephone and individually regulated air conditioning. A indoor swimming pool is to be found within the hotel. Guests are invited to serve themselves from the breakfast buffet. 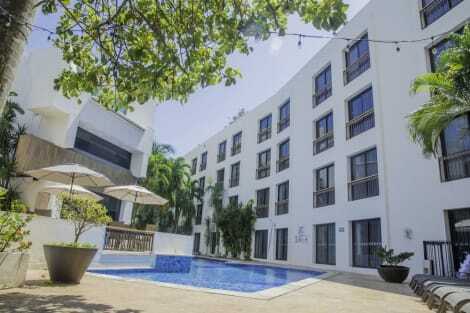 Only 10 minutes’ drive from Chetumal’s town centre, Hotel Hacienda Campestre offers the guests an on-site water park. Wi-Fi and private parking are available for free. The rooms have simple and functional décor, air conditioning, and flat-screen cable TV. The private bathroom provides free toiletries. Some units also have a balcony. The restaurant at Hotel Hacienda Campestre serves typical regional cuisine and Mexican dishes. Hotel Haciend Campestre also has meeting rooms, children’s playground and pool, plus 24 hours front desk services. The Chetumal Airport is 7 km from the hotel, and Bacalar can be reached in a 40-minute drive. Satisfy your appetite for lunch or dinner at Nah Balam, a restaurant which specializes in international cuisine, or stay in and take advantage of the room service (during limited hours). Quench your thirst with your favorite drink at the bar/lounge. Cooked-to-order breakfasts are available daily from 7 AM to 11 AM for a fee. Take advantage of recreation opportunities such as a fitness center, or other amenities including complimentary wireless Internet access and tour/ticket assistance. Getting to nearby attractions is a breeze with the complimentary area shuttle that operates within 10 km. lastminute.com has a fantastic range of hotels in Chetumal, with everything from cheap hotels to luxurious five star accommodation available. We like to live up to our last minute name so remember you can book any one of our excellent Chetumal hotels up until midnight and stay the same night.